Minato was a fairly tall, fair-skinned man who on more than one occasion has been compared with Naruto in terms of physical appearance; both have bright blue-eyes and spiky blond hair. Unlike Naruto, Minato had jaw-length bangs framing either side of his face. According to Jiraiya, Minato was considered to be very handsome, as many women were infatuated with him. His normal attire consisted of a standard Konoha-nin uniform with two bands each on both of his sleeves, a flak jacket and a forehead protector; after becoming Hokage, he started wearing a short-sleeved long white coat over his normal attire, decorated by flames-like motifs on the edges, with the kanji for "Fourth Hokage" (四代目火影, Yondaime Hokage) written vertically down the back, and closed on the front by a thin orange rope. In his youth, he wore a tracksuit with three stripes on the sleeves, mesh undershirt, dark trousers and dark calf-length sandals. Jiraiya and Tsunade pointed out that, while Naruto physically bears great resemblance to Minato, his personality is almost identical to his mother. While Naruto is boisterous and relatively thick, Minato was calm, collected, and highly perceptive. He also seemed well aware of the terror his reputation inspired in his foes. He appeared to be respectful of those around him; he didn't like freely speaking about others' pasts, and was said to be a very nice person. He deeply cared for and loved his wife and child, becoming very nervous because of Kushina's pain during labour and even shedding tears of joy at his son's birth. He also enjoyed reading, and took a special liking to reading Jiraiya's work in particular. Description: The user will concentrate their chakra and by placing two of their fingers on a surface they can then track and locate their target. This technique is even capable of telling the user exactly how many targets there are and if they are very skilled also. Note: User must remain stationary and can only be used by Tobirama Senju and Minato Namikaze biograhies. Description: Rasengan was a Ninjutsu technique developed over the span of three years by the Fourth Hokage. The technique was taught to his sensei Jiraiya, who then passed it on to the young ninja Naruto years later. The technique is unlike many other jutsu in that it does not require any hand seals. It just relied on the ninja's ability to mold chakra. The ninja concentrates a contained, fast, rotating sphere of chakra in the palm of their hand, which can create a destructive impact. Limit: None. Description: This is a space/time ninjutsu.This jutsu can only work if the user throws a kunai with the special shiki-jutsu(seal jutsu)or has tagged the item or person by touch.The user can instantly teleport to the tags location. Description:To summon the creature the ninja will wipe blood on the hand, perform the necessary handseals and then touch their hand to the ground or another object. Though it appears that as long as significant pressure is placed against the blood in some form, the summon will be complete. There can be variations to the summoning steps, some ninja like Temari will wipe blood on her fan, then by swinging the fan the animal is summoned. Other ninja like Orochimaru wipe the blood across a snake tattoo on their arm first, then touch the ground. Description: The user summons Gamahiro above the target, crushing whatever is beneath him when he falls to the ground. Description: Minato dashes toward his enemy and kicks them on the knee. He then slides behind them and kicks the same knee again in such a way that they fly into the air. Description: Minato dashes toward his enemy with such high speed that he looks like a blur and hits them as he passes them. Then, he stops behind them and slashes them on the back with a kunai. Description: Oodama Rasengan is an advanced Ninjutsu technique that creates a very large Rasengan ball. Note: Must already know Rasengan. Description: Minato kicks the opponent in the air throws his Flying Thunder God Kunai, repeats the pattern and uses Rasengan on the opponent when on the ground. Note: Can only be used Twice by Minato Namikaze. Description: Minato will blast the target into the air with a rasengan and then proceeds to throw one of his space-time kunai behind them. As he teleports behind them, he strikes them in the back with another rasengan that expands to a bigger size before exploding the target into the ground. Note: Can only be used once with a Minato bio. Description: Minato will perform the following hand seal Ram, with the use of his space-time kunai, to form a barrier that will teleport away incoming attacks that sent at it. He is capable of diverting away an attack as large and powerful as a chakra blast from the nine-tailed demon fox. Once the technique is warped away Minato has to direct it to another location. Note: Can only be used 4 times and can only be used by a Minato character. Description: The user, or his clone, makes nine handseals and then claps his hands. This summons the Shinigami, who appears behind the user and wraps its left arm with prayer beads. The soul of the user is visible, bound to the Shinigami. The Shinigami then extends its hand through the user's chest, grasping the opponent if he is within short range, and begins pulling out his soul. Once the Shinigami has grasped the opponent, he is completely immobile, although he can use weapons, summonings already existing, etcetera to try and kill the user before the technique completes. At the user's command, the Shinigami then performs the sealing, locking away the victim and the user's soul to battle for all eternity in the Shinigami's stomach. Note: If used by the user himself, causes him to die. Note: This technique can be used only a maximum of two times by clones, and once by the user himself. History: When Minato was in the Ninja Academy, his classmate and future wife Kushina Uzumaki thought he looked "flaky" and even "girly". He dreamed of being acknowledged by the Konoha villagers by becoming Hokage, which Kushina considered to be an impossible dream for someone like him. Years later however, when Kushina was kidnapped by Kumogakure ninja, Minato was the only one to pick up on the fact that she was leaving behind strands of her red hair to mark their path. After rescuing her, Minato explained that he had always admired her hair. No longer seeing him as "flaky", she fell in love with him. According to those who knew him, Minato was a very talented ninja, having been considered a rare genius that appeared only once a generation. He graduated from the Ninja Academy at the age of ten, and was added to a genin team under the tutelage of Jiraiya. Jiraiya took a special interest in Minato, and accepted him as an apprentice, amongst other things teaching him the Summoning Technique. Jiraiya even believed Minato might be the Child of the Prophecy, someone who would someday save the world. 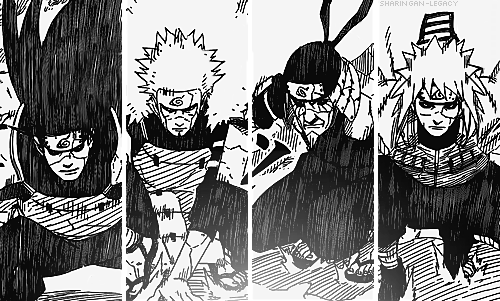 In time, Minato was put in charge of a genin team of his own, consisting of Rin, Obito Uchiha, and Kakashi Hatake. During the Third Shinobi World War, Minato led his team on a mission into Kusagakure to destroy the Kannabi Bridge. Because Kakashi had recently become a jōnin, Minato gave leadership of the mission to Kakashi while he went to help Konoha's forces on the front lines. After meeting up with the surviving and out-numbered Konoha ninja, Minato used his Flying Thunder God Technique to destroy the opposing Iwagakure ninja. He then returned to his team, just in time to save Kakashi and Rin from another group of Iwa forces; he was too late to save Obito. When Kakashi and Rin recovered from the ordeal, Minato helped them complete the mission. At their first meeting he recognised A's brother Killer B as the jinchūriki of the Eight-Tails. Upon receiving the signal that Konoha was retreating, he declared that they would later face each other to put the title of Kage on the line and also offered A the advise of making sure his brother knew who he was before becoming neither human nor jinchūriki. When the war ended, Minato, not yet thirty years of age, was chosen to become the Fourth Hokage. At some point during his reign he read Jiraiya's first book. He liked the main character's determination, believing he was just like Jiraiya. Since Kushina was pregnant with their son, Minato informed Jiraiya that they planned to name their son "Naruto" in the hopes that he would be just like the main character and, in turn, Jiraiya. Jiraiya warned them that this would make him Naruto's godfather, but they insisted that this was a good thing. Because Kushina was the jinchūriki of the Nine-Tailed Demon Fox, special arrangements had to be made for Naruto's birth. Since the seal keeping the Nine-Tails within her would weaken during childbirth, Naruto would secretly be delivered in a remote location outside Konoha. ANBU would guard the area and Minato would maintain the seal while Kushina went into labour. Soon after Naruto was born they were found by Madara Uchiha. Madara killed all of the ANBU and took Naruto hostage, threatening to do the same to him. Minato was able to take Naruto back, but this gave Madara the chance to escape with Kushina. Minato found a safe place to put Naruto and then teleported to Kushina. He arrived in time to stop the Nine-Tails, having been removed from her body, from killing her, and teleported back to Naruto. Minato reunited mother and son and then went to help defend Konoha from the Nine-Tails. Minato arrived in the early stages of the Nine-Tails' attack. After protecting the village from its Tailed Beast Ball, Minato tried to reach the Third Hokage to inform him of what had happened. He was stopped by Madara, who tried to send him away. Minato escaped but was followed by Madara. When the two began fighting, Minato struggled to hit Madara, Madara being intangible whenever he was not currently attacking. By carefully timing his Flying Thunder God Technique, Minato was able to strike him during one of these rare moments and apply a seal for the Flying Thunder God Technique to him, allowing him to teleport to Madara whenever he wanted. He placed a Contract Seal on Madara to remove the Nine-Tails from his control, forcing Madara to flee. Gamabunta to distract the Nine-Tails long enough to teleport it away from the village to Naruto and Kushina's location. Kushina restrained it and, dying from the trauma of its removal, volunteered to have it sealed back into her body so that it would die with her. Distraught, Minato suggested instead using the Dead Demon Consuming Seal on the Nine-Tails to weaken it and then seal the rest into Naruto. Kushina objected since this would mean Minato's death and give Naruto a horrible, lonely life. Minato insisted it was for the best since allowing the Nine-Tails to resurrect itself, without a jinchūriki to contain it, would inevitably cause harm to Konoha and the Fire Country. Also, Minato was convinced that Naruto, the "Child of the Prophecy" Jiraiya had once told him about, would need the Nine-Tails' power to someday defeat Madara. After Minato used the Dead Demon Consuming Seal on it, the Nine-Tails realised their intentions and tried to kill Naruto, but Minato and Kushina used their bodies to shield him. , and not the container of the monster that caused so much death and destruction. • Space-Time Ninjutsu: Minato was famous for his unique space–time technique, the Flying Thunder God Technique, which essentially allowed him to teleport to any location with the use of special seals. The technique earned him the moniker of Konoha's "Yellow Flash", due to the untraceable movements Minato had when using this technique. By throwing kunai that had the seal attached to them behind enemy lines, Minato could wipe out an entire platoon in the blink of an eye. Minato could teleport to his special kunai even as it travelled through the air. He was also capable of applying the seal to solid surfaces with his bare hand, allowing him to tag opponents and give himself an easy way to track and reach them. He also incorporated this seal formula into Kushina's seal so he could always come to her aid. For defensive use, Minato was capable of implementing space–time barriers to counter large attacks such as a Tailed Beast Ball, sending the blast to a distant area away from the village. He was even able to teleport the Nine-Tails, albeit at the cost of a large portion of his chakra due to the beast's immense size. • Fire Release: With Minato's mastery of the Fire Release, he's able to perform any Fire Release technique with the usage of a single handseal, even the most complex Fire Release techniques. • Taijutsu: One of Minato's trademark attributes was his immense speed and instantaneous reflexes, able to react fast enough to catch an infant Naruto mid-fall to prevent him from being stabbed by Tobi. This attribute earned him the moniker of "Konoha's Yellow Flash". He could also respond to Tobi's Space–Time Migration technique quickly enough to escape it. He is often referred to throughout the series as the fastest shinobi who ever lived, with the speed of the currently fastest living shinobi often being compared to his own, such as A or Naruto in his Nine-Tails Chakra Mode, with the former admitting that even with his Lightning Release Armour enhancing his already immense speed and reflexes was still outmatched by Minato. Even when assisted by his brother, A was unable to lay a hand on Minato. When fighting, he mainly employed the use of his unique kunai, wielding them proficiently and taking advantage of their particular form, which made them even more suitable for close range combat than standard kunai. Using this type of kunai, he was able to nearly sever one of the Eight-Tails' tentacles when B moved to save his brother from Minato's counter-attack despite having nearly no leverage, showing that he possessed a great deal of strength. • Fūinjutsu: Minato was very knowledgeable in fūinjutsu, partially due to Kushina teaching him some of the Uzumaki clan's unique sealing techniques. He knew the full capabilities of the Dead Demon Consuming Seal and was aware that he could not completely seal all of the Nine-Tails' chakra within the death god. Minato could also remove an opponent's ability to use the Summoning Technique. 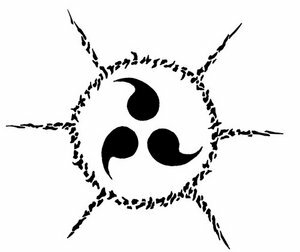 The greatest example of his prowess with fūinjutsu is the seal used on Naruto, placing two Four Symbols Seal to create the Eight Trigrams Sealing Style, which would allow small amounts of the Nine-Tails' chakra to leak out and naturally mix with Naruto's own. Minato also sealed some of Kushina's and his own chakra within Naruto so that they could see him when he was older, and assist him in dealing with the beast. Due to his fūinjutsu training Minato has a pair of weapon summoning seals located around both of his wrists, allowing him to summon various types of weapons and scrolls, also he has a seal on the center of his chest that activates upon his death, called the Reverse Four Symbols Sealing, and two seals located onto the back of Minato's hand, these seals are called the "Self Disruption Seals", another 2 seals are located onto Minato's lower part of his left arm, called the "Gaseous Barrier" Seal, Minato became so skilled at using Fūinjutsu techniques that he has tremendous chakra control, giving him the title of a Fūinjutsu master, he is capable of using the Chakra Transfer Technique's variant that's usable only by Fūinjutsu masters. Description: This technique is a seal that's printed usually on the back of the user's hand, with the mark of "Disruption" in a large Kanji letter, this is a special seal that has only one purpose, which is to alert the user of foreign chakra in which it enters the user's body, which is basically what activates the seal's ability, This seal has some of the user's own chakra and is connected directly to the user's chakra circularity system, therefore when a foreign chakra enters the user's body, the user's chakra inside the seal is disrupted and when the disruption happens it causes the seal glows in a dark red color and surges of red lightning like surges of light, these surges produce a sound that's familiar by the user as well as the bright glowing light alerting the user that a foreign chakra has entered his body, this is a pretty useful technique since it alerts the user of foreign chakra in which inside his body by his opponent the second the foreign chakra enters the body, which is useful in letting the user know that he is under a genjutsu technique used by his opponent, the only downside to this technique is that if the user used the Cursed Seal, Sage Mode, Bijuu Techniques or Eight Internal Gates, the Seal would glow as well since it's a foreign chakra that's not the user's own, thus the user isn't able to know if he's under a genjutsu whilst any of the previously mentioned modes are active. Note: The Seal glows 3 times per battle. Note: No Fūinjutsu techniques A-rank or above the turn the seal activates. Note: Can only absorb up to S-rank invisible gas techniques once per Seal. Note: Max amount of seals applied to the user are 2 Seals. Note: No A-rank and above Fūinjutsu techniques in the same turn. Description: This is an advanced ability that ninjas with great chakra control can learn to use and that Bijuu possess innately. The user will release his or hers unmolded chakra onto another ninja, effectively transferring it. The technique has many uses, from restoring an allies chakra to releasing him from a Genjutsu or simply to give him more chakra to mold, allowing him to drastically boost the power of a technique. Tsunade could even use this technique, together with her Creation Rebirth technique to, in conjunction with her summon Katsuyu, heal multiple people at the same time during Pain's attack on Konohagakure. If used to power the use of a technique, the recipient of the chakra can boost one technique by adding +20 chakra to it which increases its damage by +40. To do this, the recipient must mold the technique while the user of Chakra Tenso no Jutsu is transferring chakra into him, meaning that both the transfer and the technique must be done at the same time. The transfer can only be done with direct contact between user and target and restores the targets chakra by 80 points per turn. Bijuus can use this technique on their host to restore their chakra reserves or boost their stamina by giving them 200 chakra points directly with each use. This advanced ability is the core method through which Bijuus and Jinchuriki use their techniques, as chakra cloaks and complete/incomplete transformations are advanced uses of Chakra Transfer, where the bijuu transfers his or her chakra onto his or her host. Note: Cannot be used to power the users own techniques. Note: All Jinchuriki can use this technique. Note: Usable 3 times per battle. Nooooo not the legendary kakashi user Dante ~.~ dropping kakashi. I gotta say this only because I want to. Why not test for naruto Dante I am sure you would pass. Lol >_> You should put Freeza's one, a bit more intense. I should shouldn't i? >_> but i don't like Orochimaru, and i don't have Kinjutsu yet lol. Honey, everyone can go with a little luck in life. Why are you doing this to Kakashi >.> All he gave you was love and fangirls!